Facebook's most feared rival ; runner-up of most-used blog in Enfield 2001 - quarter final stage. 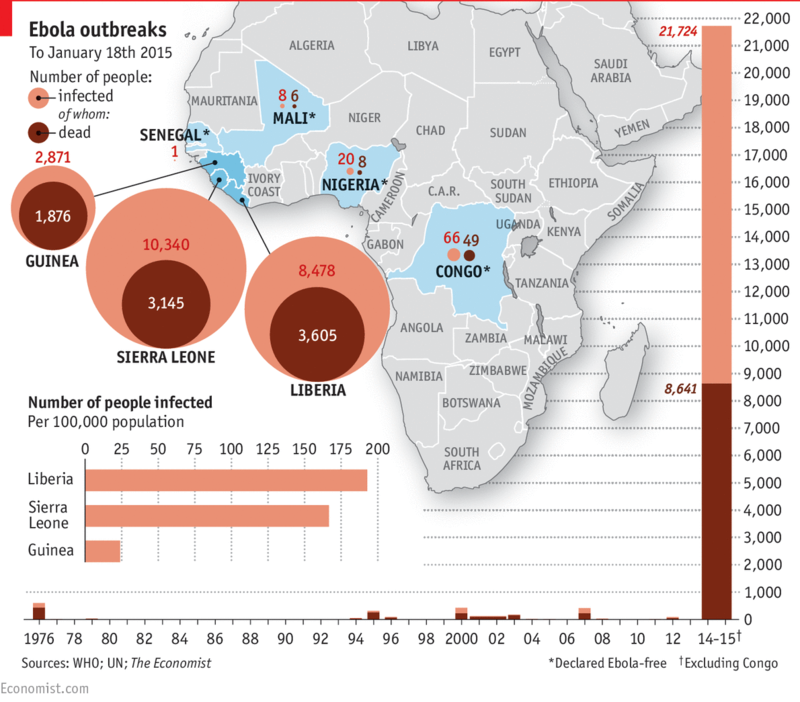 As we know, the first reported case of the Ebola outbreak damaging West Africa in December was in Gueckedou in Guinea. Travellers took it across the boarder and by March eight cases were found in its neighbouring Liberia and Sierra Leone. By June of 2014, 759 people had been affected with 467 dying from the disease, making it the worst Ebola outbreak ever seen with the numbers rising but being controlled well by specialised doctors from all over the world. As recent as last week, 21,724 cases of Ebola was confirmed with 8,641 deaths with the vast majority of these cases and deaths occurring in Liberia Sierra Leone and Guinea. These countries will have long term effects as the moral panic caused by the outbreak has deterred people from travelling to countries such as Sierra Leone who rely heavily on their tourist industry. Sadly, the outbreak continues to claim lives, but there are glimmers of good news recently. Cases have fallen in Guinea, Liberia and Sierra Leone and the WHO (World Health Organisation) states that there is now enough treatment beds to be able to isolate patients and treat Ebola. The rate at which Ebola has given a rise to other communicable diseases is a key variable in aiming to contain Ebola. For easily communicable diseases the risk of catching other diseases can be high; for example measles begin very high. The very high mortality rate of the disease is 60% in this current outbreak which means that Ebola can quickly claim more lives than other killers such as Malaria and Chikungunya. The unsatisfactory health systems in the three affected counties seem to help give a valid reason for why the Ebola outbreak has got this far. Developed countries such as Spain spend $3,000 per person at PPP(purchasing power parity) on healthcare which contrasts to Sierra Leone where the figure stands at just under $300. The vulnerability of health workers to Ebola therefore is a tragic issue. As of January the 18th, there has been 828 cases amongst medical staff in the three west African countries with 499 death and counting. #.How to eliminate your Wealth Blocks and fortune grow into WEALTH. Nice information keep sharing with us. Please check out bt email helpline also. I hope it will help you. Incredible post, you provide unique information in your blog. When the sadness is surging in the chest, the warm will come in time, and ease the pain in your heart. This is life.